What does it mean to have Jupiter in Libra? They are balanced people who can overcome even the most difficult situations. The desire for justice is what drives Libra, and Jupiter in Libra takes that drive and uses it to bring good fortune into their life. They are luckiest when they are mediating a tough situation. Their ability to listen to all sides and make the correct decision is unrivaled. It’s this capacity to accurately read and solve a complex problem that attracts luck and good vibes to the Jupiter in Libra. Planet Jupiter is all about our travel habits, assessing our values and the way we draw good fortune into our lives. For Libra, they are all about being fair, and others appreciate their honest take on any issue because they can see the deliberation that goes on in their mind. As an air astrology sign, Libra tackles any situation head-on, literally, by analyzing every aspect of a problem. It’s their strong sense of justice that appeals to people. And they bring in many opportunities suited to their specific skill set because of that. Jupiter in Libra knows how to maintain a sense of harmony. This is also appealing to those who despise chaos. They will work the hardest of any sign to maintain balance in everything. Libra is also a social zodiac sign, as they don’t like to be alone. Symbolized by the scales of justice, they also feel like only one half of a whole picture. They will strive to find the right person to complete their picture of a balanced life. Because of this, they know how to work a crowd with their endless charm and grace under pressure. And it’s this same charisma that continuously brings in Jupiter in Libra luck and practical possibilities. Their natural ability to restore order to the world is a big draw for businesses and loved ones alike. And, their values of diplomacy and compromise help them to maintain these connections. And when they find others who share these values and believes there’s no stopping them. Their dedication to justice and fair play take them as far as they want to go. And the wit and creativity of the Libra Jupiter people sustain the satisfaction they find on every leg of the journey. The only thing Jupiter in Libra has to be careful of is allowing themselves to become too confident in their thoughts or actions. The way others react to their decisions can make them grow cocky and overly self-assured, which can make them feel invincible. And while they generally have good judgment, an inflated sense of self can tarnish their ability to see everything clearly and make a rational decision. But if they can keep their ego in check and practice what they preach in terms of personal balance, they will remain solid and trusted individuals. And with that kind of respect, the Jupiter in Libra career will attract new opportunities around every corner. This will help them to develop whatever kind of career they want, whether it be humanitarian efforts or becoming part of the legal system. Just as long as they don’t take too long to make a decision, they will find themselves in favorable circumstances. 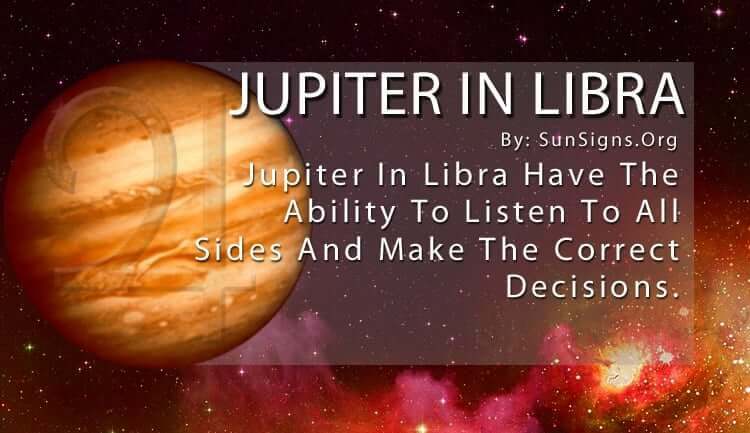 Their worst enemy is indecisiveness, and Jupiter in Libra will have to fight to keep that potential problem under control. But they also know the gravity of the situations they find themselves in. And, that helps to keep them on track. Nothing can keep them from making things right.